In July, Kim, Aidan, and I packed up the car and headed West. Well, actually, we drove North to my mother’s in Osage, Iowa, first, and spent a traditional 4th of July week there with fireworks, the parade, barbecue, ice cream, and lots of local flavor. 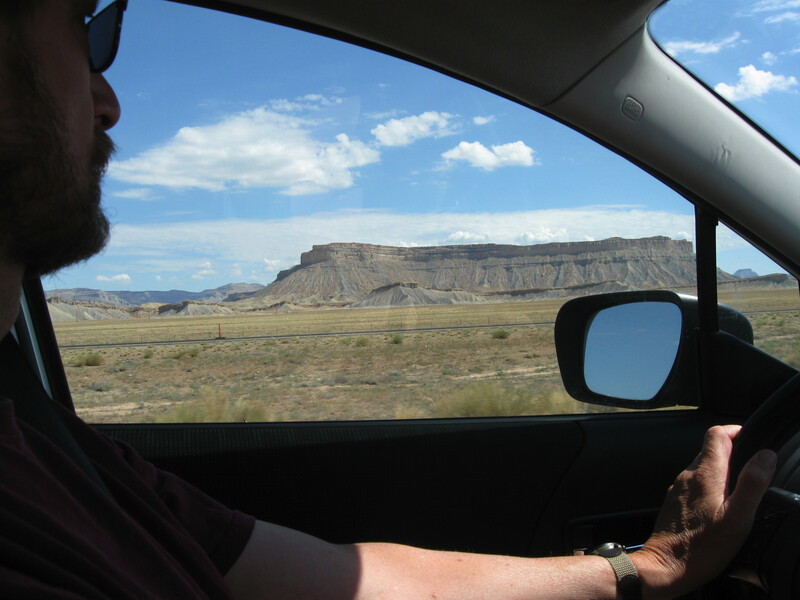 Then we turned the nose of our Mazda west for an old-fashioned car-camping vacation. It was the kind of trip my family used to take nearly every summer. Long hours on the road with plenty of stops at national parks and other scenic places. So sitting behind the wheel and going back through this country was like a trip back in time, even though our pop-up tent was a lot easier to manage than my family’s Camp-O-Tel. Back in the day, this was a tent that you put on top of your car. When you got to your campsite, you could unfold it and sleep up there. My parents slept in the car on a mattress, and us kids were in the car topper. There was a stove we could get down for cooking, and a ladder we could climb up when it was time for bed. It was the precursor to the ubiquitous pop-up trailer, which soon eclipsed the Camp-O-Tel. Even when we were using it, we rarely saw another one. This summer, we had a little 5-person tent (those would be very skinny folks — the three of us had little room to spare, and we’re not big!) We had our sleeping bags, an air mattress (some of us are not as young as we used to be), a camp stove, cookware, food, and three suitcases, plus hiking boots, sunscreen, jackets, camp towels, flashlights, lanterns, and assorted other equipment all piled in the back of the Mazda. It was organized chaos, especially after a few days camping, but we managed 10 nights without much problem and only one night in a hotel when it rained all night. Fortunately, this was a break we had planned, and we guessed right about the weather. The next couple of nights we also had thunderstorms, but they didn’t last too long and the rain wasn’t so bad, so the only real issue was lightning. We went first to the Badlands (where we had our only bad experience with an RV that ran its generator all night, grrr), then on to Rushmore and Custer State Park. From the Black Hills, we headed on to Yellowstone, stopping first just outside the park at Buffalo Bill State Park — a nice park but for the mosquito swarms that hit for about an hour at dusk and for the irrigation sprinklers that went off in the night (not at our camp spot, fortunately). We stayed in Yellowstone 4 night, which was a huge relief after setting up camp and packing it all up the next day for several days running. That also allowed us to be in the park and get to the sites we wanted to see each day much more quickly. Because it is bear country, we had to pack all of our food in our car when we weren’t actually cooking. We took advantage of this fact to have dinner out a couple of times, extending the amount of time we had in the park. We saw most of the main geysers and hot springs, saw lots of wildlife including so many bison we were nearly tired of them by the time we left, and hiked several trails. We didn’t do much back country hiking, though we went far enough from the boardwalks that we did carry bear spray to be on the safe side. Four nights were enough that we felt we really saw the park, but we also realized we could spend a week there (or much more) and still just touch the surface, especially if you got off the beaten track more. Some of our highlights besides the main attractions were Lamar Valley at sunset (in a thunderstorm part of the time, but it was still beautiful), swimming in Burning River, and hiking to the suspension bridge across Hellroaring Creek. From Yellowstone, we headed south to Grand Teton National Park. This was the first park where we didn’t (couldn’t) make a reservation for the campground, and we were glad when we got there. Road construction meant a 30-minute delay, so we stopped at Colter Bay campgrounds and explored that area first. Here we were able to rent a canoe and spend a couple of hours on Lake Jackson. Aidan and I even swam in the lake. We also took a hike and saw some trumpeter swans nesting on one of the nearby ponds. The next morning, our plan was to get up early and beat the construction crew — didn’t quite make it even though we left the campground before 7:00, but the wait at the one-lane road wasn’t bad, and we still made it to a picnic area in time to cook a dozen eggs for breakfast. Usually we wouldn’t eat this much, but after over a week of camping, we were starting to feel the effect of camp rations and lots of hiking — a couple of us glad for the reduced padding, but ready for a more filling meal. We explored the south end of Tetons, vowing to go back and spend some more time, then headed on to Salt Lake City. We didn’t stop there, but did get our only hotel in the camping part of our trip in Provo. This was where the thunderstorms were the worst, so we were glad we hadn’t found a good park (though there is a state park we could have tried if the weather had cooperated). Next stop was Arches and Canyonlands for a very impressive, but very different kind of landscape. We went from 40 degrees at night in Yellowstone to dry and hot in Utah, but fortunately we hit it right and the highs were only in the 90’s. We took the parks’ advice and drank plenty of water. Hiked to Delicate Arch and several other short hikes around other arches. In the night we had storms and a mule deer who didn’t like us for camping under his or her mulberry trees. The next day we toured Canyonlands and headed to Mesa Verde, where we camped, hiked, and took a tour of one of the cliff dwellings in the morning. We would have loved to stay longer, but needed to hit the road for the drive through New Mexico to Albuquerque to see Rudy and the rest of the Lucero clan for a brief visit. It was great to eat Michael’s New Mexican cooking — he’s becoming quite the chef — and visit with Liz, Kyle, and Andy. Wish we could have stayed longer there, too, but home was calling. Family marked the bookends of our trip. We just had a two-day trek back to Mississippi, and for that we hooked up with friends Andy, Elizabeth, and Ely, swapping passengers and riding across Texas, Oklahoma, and Arkansas together, catching up along the way. It just so happened that both families were returning from our Western vacations on the same days, and our paths crossed in Albuquerque. We spent the night in a hotel in Oklahoma city (they weren’t camping, and hoteling it allowed us to get a little further each day) and separated in Memphis at the visitor’s center rest area. After two weeks on the road, we returned refreshed, though ready to be out of the car. We had seen a ton of scenery along the way and had some great experiences. We’ll definitely be planning another old-fashioned road trip, including camping, another time soon!